Ancient Bronze Icon Rare. Religious Artifact In Great Condition. Popularity - 47 views, 1.2 views per day, 40 days on eBay. High amount of views. 1 sold, 0 available. High amount of bids. 47 views, 1.2 views per day, 40 days on eBay. High amount of views. 1 sold, 0 available. High amount of bids. Ancient Bronze Icon - encolpions. 12th to the mid-14th century. Very Rare !!! Ancient Bronze Icon. Saint Nicholas. VERY RARE !!! Ancient Bronze Icon. VERY RARE !!! Ancient big bronze icon on a body Sv.Nikolay19 century Rare. Ancient Bronze Orthodox Folding Icon. Religious Artifact In Great Condition. Ancient bronze icon Grieving Holy Mother of God 19 century Rare. John the Baptist Ancient Bronze Icon. VERY RARE !!! 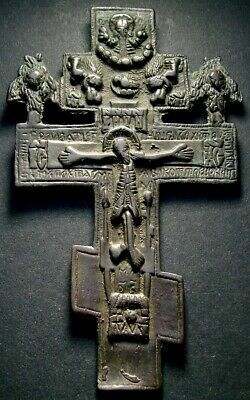 Highly Ancient bronze icon on a body Sv.Nikolay18 century Rare. Ancient bronze icon in enamels, Very rare.